It's best to avoid going foul while waterfowling. Maine laws require hunters to properly identify their target before aiming and firing. The principle objective is safety, to avoid mistakes, although it baffles me how anyone could mistake one species of mammal for another. No, the real difficulty comes with waterfowling. During the fall migration, the wetlands, waterways and waterbodies of Maine are visited by a couple dozen or so species of waterfowl. Each has different seasons and bag limits, which means waterfowl hunters need to be able to identify each to species, or at least to tribe. There’s no substitute for time spent afield but there are a few things like location, habitat and behavior that you can use to narrow the possibilities. First let’s look at the puddle ducks or dabblers. They inhabit primarily freshwater ponds and marshes, sticking mostly to shallow areas where they dabble for food at the surface while partially – never completely – submerged. The most common in Maine are blacks, mallards, teal and wood ducks, though you may encounter the odd pintail, gadwall or wigeon. Dabblers take off by launching more or less straight off the water and land similarly, backpeddling their wings and dropping straight down. Teal are basically miniature versions of the larger puddlers that fly in a rapid, zigzag pattern. Blue-winged teal are usually gone south before our seasons open and the green-wings aren’t far behind. The greatest identification challenge is probably between black ducks and hen mallards. Black ducks are a much darker chocolate brown and mallard hens are more tan. Wood ducks are about midsize between teal and larger dabblers, more typically found on smaller ponds, rivers and streams, and often give a whistle or high-pitched whining call while in flight. They too head south before the real cold comes. 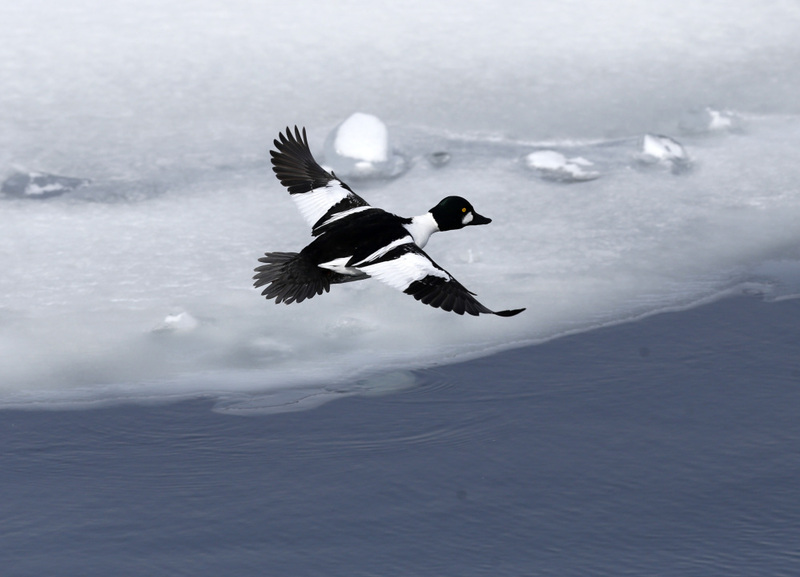 Next are the divers, like goldeneyes, buffleheads and mergansers. As their name implies, they dive for food, and are more common in deeper waterbodies and waterways. Because their wings are smaller compared to body mass, they must skitter across the surface to build up speed before they can take off at a steep angle. Similarly, they land by gliding in and surfing across the surface before coming to a stop. Lacking the more colorful patterns of male dabblers, they’re typically some configuration of black and white, hens being similarly drabber than drakes. Though similar in appearance with their slender bills and bodies, mergansers can perhaps best be differentiated by habitat. The larger common mergansers prefer moving freshwater and seldom anything else. Midsized red-breasted mergansers are most common along the coast, only occasionally venturing inland. And you’ll find hooded mergansers in some of the same places you find wood ducks, or ring-necks. It’s good to at least be able to distinguish a merganser from a dabbler or diver; all three species are nearly inedible, unless you like anchovy-flavored liver. Then there are sea ducks: scoters, eiders and oldsquaw. They’re found mainly along the coast, though strays will occasionally wander up rivers and more rarely onto large lakes. They land and take off in much the same way as divers and feed well below the surface on fish, crabs and mussels. Eiders are the largest, males being boldly black and white, and females being chestnut brown. Any plumage pattern in between is usually a young male. The slightly smaller scoters are mostly black with subtle white markings. Oldsquaw or long-tailed ducks are smaller, often travel in small flocks and can make a racket. There’s another group that could cause some confusion. Fortunately, they’re very uncommon in Maine. The pochards or bay ducks include scaup, redheads and canvasbacks. In shape they resemble dabblers, but in color and behavior they’re more like divers, with smaller wings and preferring deeper waters. In profile they have a distinctly black-white-black color pattern, with redheads and canvasbacks having rusty-colored heads. One exception is the ring-necked duck, which is also poorly named because you’d be hard-pressed to see the ring on its neck. These diminutive ducks cross all boundaries, resembling pochards in appearance, landing and taking off like divers but preferring habitat like dabblers and wood ducks. Fortunately they usually head south early. Buffleheads are another species that seems confused. They seem to prefer deep freshwater lakes, larger ponds and rivers as much as coastal rivers, bays and estuaries. They’re about the same size as a teal and seem to have a remarkable ability to fly through shot unfazed. That’s a very rough discrimination of the common waterfowl in Maine. Fortunately, bag limits offer wiggle room for those who can at least identify a duck to a group but may not be sure of the species. The best advice is if you’re not sure, don’t shoot.